Last week at Paint Your World started new challenge - Christmas Tree - and I was lucky to be their Guest Designer. Here's my card I made for the challenge. Минулого тижня в блозі Paint Your World розпочалося нове завдання - Ялиночка - і я мала приємність бути запрошеним дизайнером. Для завдання я зробила ось таку листівочку. For my card I used ММЕ Paper Set Merry. Stamp from Pink Cat Studio I coloured with copic markers. I used Cheery Lynn Dies: Nautical Wheeler Doily and French Pastry Doily. Sentiment stamp is from Unity Stamp Co.
Для листівки я використала папір ММЕ Merry. Штамп від Pink Cat Studio я розмалювала маркерами копік. Серветочки я вирізала за допомогою ножів Cheery Lynn: Nautical Wheeler Doily і French Pastry Doily. Штамп напис від Unity Stamp Co. I also used some crushed velvet and clear glitter on the stamp and covered wooden snowflake with lots of red glitter. Merry Christmas to all my lovely followers!! I wish you a lot of joy these days and every day! Усім, хто святкує сьогодні Різдво, щиро бажаю радісних свят!! Смачної куті та веселої коляди! Лілю, вітаю з ЗД - чудова листівочка!! Omg.... I love it!! The image is so adorable!! Thanks for joining us this week at Glitter n Sparkle.. Beautifully done- love the great colors you used and love the doily BG! Here from MIM- I am #'s 48 and 200. Fabulous card. Love your layout. 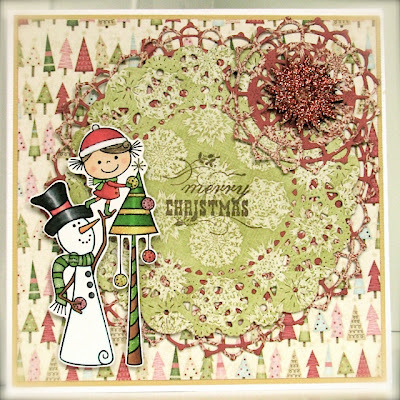 Beautiful card, thanks so much for taking part in the Cheery Lynn Designs challenge this week! Really cute card love the doily and the bling in the corner. I saw your card on MIM. Darling images too. Fabulous texture and I love the vintage colours with such a cute modern image. Thank you for joining us at at the Crafty Bloggers Network Challenge. This is such a sweet card! 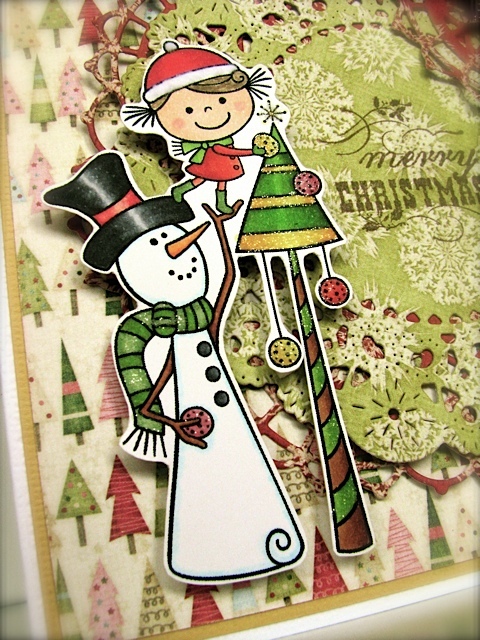 Thanks so much for sharing it and joining along with us at the Cheery Lynn Designs Challenge. Good luck and I hope you have a wonderful New Year!